November 10, 1978. The segment above the confluence of the North Fork of the St. Joe River to St. Joe Lake. Wild — 26.6 miles; Recreational — 39.7 miles; Total — 66.3 miles. 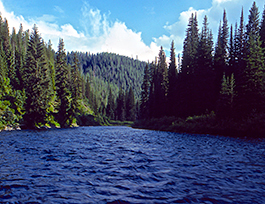 This northern Idaho river features crystal clear water and offers outstanding scenery, excellent catch and release fishing, and plenty of wildlife. There are numerous small, rustic campgrounds along the shores of the roaded portion of the river (39.7 miles) and a trail along the entire wild portion (26.6 miles)of the river to its headwaters at St. Joe Lake. The river was originally named the "St. Joseph" by Father Pierre-Jean Desmet, a Catholic priest who established a mission nearby.